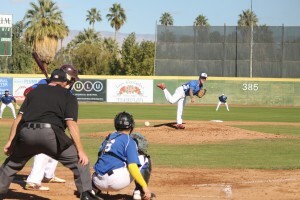 PALM SPRINGS, Calif. – Fans in attendance at Palm Springs Stadium on Friday were treated to two dramatic come-from-behind outcomes in the final inning of play. The Washington Blue Sox triumphed over the Alberta Grizzly, 5-4, while the Toronto Rush handed the Canada A’s their first loss of the season in an 8-5 final. With the ball game tied at three after seven innings, the Grizzly (3-4-1) and Blue Sox (6-2) agreed to play one extra frame with the international tie breaking rule put into effect. With a runner beginning on second base with nobody out, Alberta’s Gabe Gunter scored a run on a groundball to the shortstop that kicked out into centerfield to take a 4-3 lead. In the bottom of the eighth with a man on second, Washington’s Zach Compton powered a two-run walk off home run out to left field to win the game for the Blue Sox. Adam Falcon got the win for Washington after striking out two and allowing one unearned run on two hits in two innings pitched. Carl Witkowski took the loss for Alberta. Game two featured a back-and-forth affair between the Canada A’s and Toronto Rush that was ultimately decided by a five-run top of the seventh inning. Trailing 2-1, the Rush (4-3) tied it in the fifth after Alex Rojas smoked a pinch-hit solo-home run to left field. The 2-2 deadlock was quickly broken in the bottom half, as Canada (6-1) sent eight men to the plate and scored three times to go up 5-2. Robert de Angelis followed Rojas’ home run with a double in the sixth inning and scored on a two-out two-bagger hit by Connor Hoffman to make the score 5-3. In the top of the seventh, A’s right-hander Clayton Dostal hit the first batter he faced. Cameron Franklin and Nick Landell reached on errors by the shortstop to load the bases. Then, Raul Shah grounded to third baseman Zach Files, who fired home to retire the lead runner, but catcher Jovany Felipe did not keep his foot on home plate to record the force out. With the deficit cut to 5-4, de Angelis doubled again and drove in two to go up 6-5. Hector Marmol followed with an RBI single to increase his team’s lead to 7-5, while Tanner Klein scored de Angelis on a sacrifice fly to ultimately lift the Rush to an 8-5 final. Rush starter Cody Pamperin was the victim of suspect defensive play, as the right-hander for Toronto allowed five runs, but pitched around three errors to keep his team in the ballgame. Andrew Baxter got the win after striking out five and allowing two hits in 2.2 shutout innings. Dostal was tacked with the loss. De Angelis finished the day 2-for-3 with two doubles, two RBI, two runs scored and a walk. Marmol had a nice day himself, going 2-for-4 with two RBI singles. In the first game of the day on the auxiliary field, the Palm Springs Power defeated the Coachella Valley Snowbirds, 3-1. Noe Arteaga started for the Power and dominated on the mound. Arteaga worked three shutout innings, allowing just one hit. He struck out six and did not walk a batter to earn the win. Toki Tamura pitched well for the Snowbirds, but got the loss. The Oregon Lumberjacks took down the Palm Springs Chill, 11-4, in a lopsided affair in the second game on the auxiliary field. Lumberjacks outfielder Stone Osborne had a big day at the plate, going 3-for-4 with a two-run home run and a two-run double. Osborne finished the game a triple shy of the cycle with three runs scored and two stolen bases. Outfielder Connor Arcobasso, who went 2-for-2 with a triple, single and two runs scored, also stood out. Richard Mariano got the win for the Jacks, going four innings with three strikeouts. Donnie Speranza suffered the loss for the Chill.